Firstly, let me introduce myself. 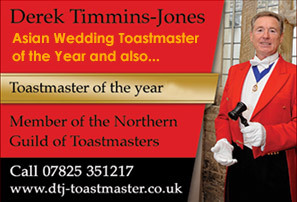 My name is Derek Timmins-Jones and I am member of the Northern Guild of Toastmasters, and as such I am a full time Professional Toastmaster and Master of Ceremonies. I am a specialist Wedding Toastmaster and Asian Wedding Toastmaster. I am based in the North West, but have through many recommendations worked all over the country as well as appearing on TV in the “Celebrity 4 Weddings” reality show on Living TV. 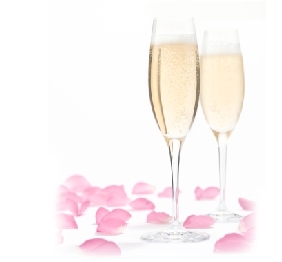 These engagements have involved officiating at a diverse range of functions and venues, covering Corporate Dinners, Fashion Events, Birthday & Cocktail Parties & Charity Dinners. However I consider myself to be a specialist Wedding Toastmaster to all faiths, with a particular specialty in being an Asian Wedding Toastmaster. I have a thorough knowledge of the customs & etiquette required in respect to services of all Faiths. I am also a Master of Ceremonies. As well as offering event management services for any type of function, I also advise on speeches, and offer help and advice on planning all the elements required to make your event run memorably and above all smoothly. Please contact me today; it would be an honour to be your Master of Ceremonies. Let me help take the stress out of your very special day. I am passionate about being a professional Wedding Toastmaster/Master of Ceremonies.